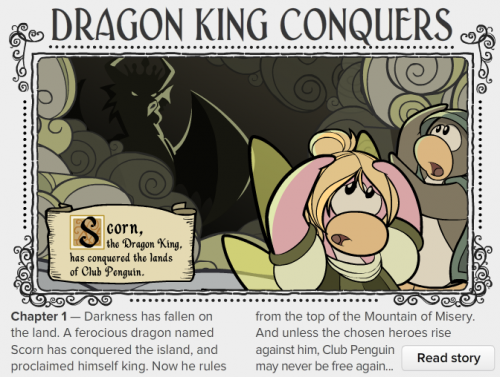 Today, Club Penguin released a new edition of the Club Penguin Times newspaper. This week's newspaper includes news about the Medieval Party which was just released moments ago. This newspaper issue also talks about the upcoming events which are - The Fairy Fables (On Now), along with Chapter 2 of scorn, and last but not least the Penguin Style Catalog. "He can be defeated with little magic and a lot of bravery." The last and final arcticle of this Newspaper arcticle are the Upcoming Events. 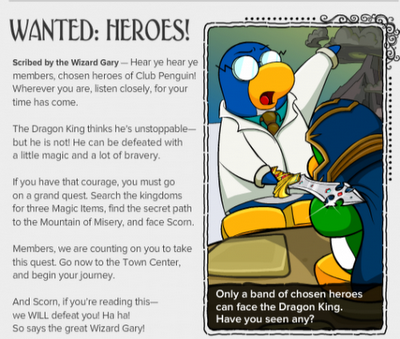 Upcoming Events are events that Club Penguin gives us ahead of time to get a good look on what's new is happening on the island. 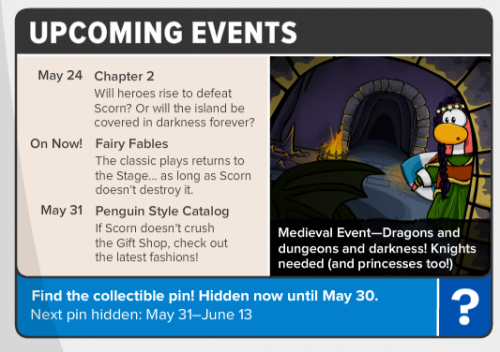 Here we have the Fairy Fables going on now and the Chapter 2 of scorn quickly approching the island along with the Penguin Style catalog coming May 31. What do you think of this weeks newspaper issue? In my opinion, I think it's mysterious with all the words Club Penguin uses to describe scorn and what he plans on doing next. What was your favorite part of this newspaper article? Leave a comment below i'd love to hear your answers!